Thursday, 15 June 2017 - At 166.7 kilometres, the 6th stage in the Tour de Suisse takes in two monstrous climbs. The route commences in Locarno and after cresting the passes of San Bernardino and Albula the finish is downhill in La Punt. Straight from the gun the riders head for the mighty Passo del San Bernardino, or San Bernadino Pass. The highest point lies at an altitude of 2,012 metres and the inclination more or less starts in Lostallo. To crest the pass the riders climb 1,645 vertical metres in 31.3 kilometres, which equals an average gradient of 5.3%. The steepest sectors account for 12%, while the highest point is at kilometre 67.5, yet the sprint for KOM-points is 1 kilometre before that. 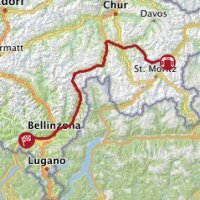 In some 50 kilometres the caravan plunges down to an intermediate section of almost 20 kilometres and then they tackle the Passo dell’Albula, or the Albula Pass. This monster is 25.8 kilometres at 5.3% with the second half steepest. Following the second intermediate sprint – at kilometre 142.5 – the climb to the top is averaging 6.5%. After cresting the Albula Pass a furious descent of 9.3 kilometres leads to the finish line La Punt. It’s a familiar recipe in the Tour de Suisse. Four years ago Rui Costa outsprinted his fellow-escapees Bauke Mollema and Tejay van Garderen after the same finale. Stage 6 in the Tour de Suisse takes in two intermediate sprints – at kilometre 133.2 and at kilometre 142.5, both come with time bonuses of 3, 2 and 1 seconds. The first three riders on the line in La Punt take time bonuses of 10, 6 and 4 seconds. Read also: results/race report 6th stage 2017 Tour de Suisse. not sure if you can receive Eurosport or other European channels, but otherwise there are several internet streams. It is a wonderfull stage, worth to watch!